This drill is a great way to start your practices. 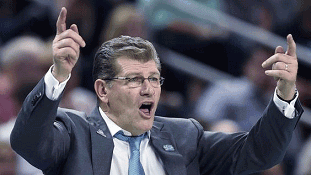 Hall of Fame UConn Women's Coach Geno Auriemma has his team do this drill every day. Not only does it reinforce fundamentals and precision, but sets a tone for an uptempo pace of play. 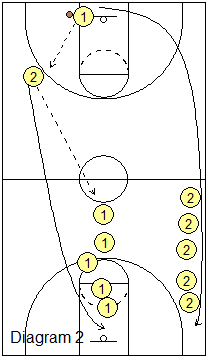 Start with two lines (diagram 1) and two balls. O1 starts a few steps behind the half-court line (don't allow players to "cheat up"), and O2 is a step or two ahead of O1 on the sideline. O1 takes two speed-dribbles, makes a jump-stop, and bounce passes to O2 cutting hard to the hoop for a lay-up. When starting the drill, the next O1 with the second ball can start the dribble once the first lay-up is made. 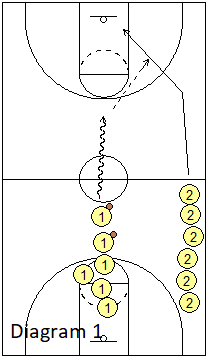 O1 gets the rebound (diagram 2) and outlet passes to O2 sprinting up the opposite side. O2 then passes to the next person in the O1 line. O2 goes to the rear of the middle (O1) line, and O1 goes to the end of the sideline (O2) line. For this drill to be effective, players must sprint and be precise with good passing, catching and finishing lay-ups. Good passing includes precise passes not only for the lay-up, but also for the outlet pass and the pass back to the middle line. Do not allow sloppiness and laziness. If you have twelve players, the team must make twelve lay-ups in a row (each player will have to make a lay-up). Any missed lay-up, bad pass, or flub of any kind causes them to start over. Once they reach twelve, then do left-hand lay-ups starting the O2 line along the left sideline. with Geno Auriemma, 2016 U.S. Women's Olympic Basket Head Coach (Gold Medal), 3x Olympic Head Coach 900 career wins - fastest coach to reach 900 wins;2016 NCAA Championship Coach, winning Back-to-back-to-back-to-back national championships (2013-16); 11x NCAA Women's Basketball National Championship Coach.